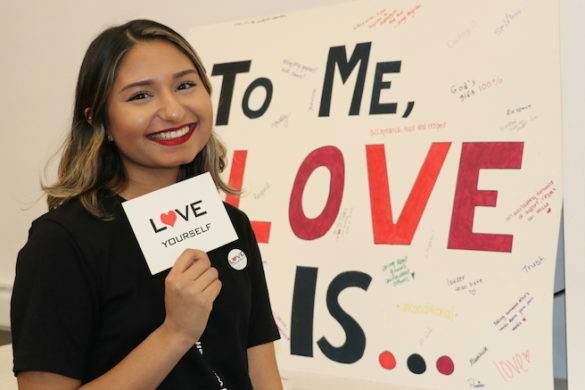 Valentina Velez Valencia strutted through the packed student lounge in Tuohy Hall this month donning a pleated dress and a matching purse made of pages from an issue of the New York Daily News during SJC Brooklyn’s Go Green Festival. 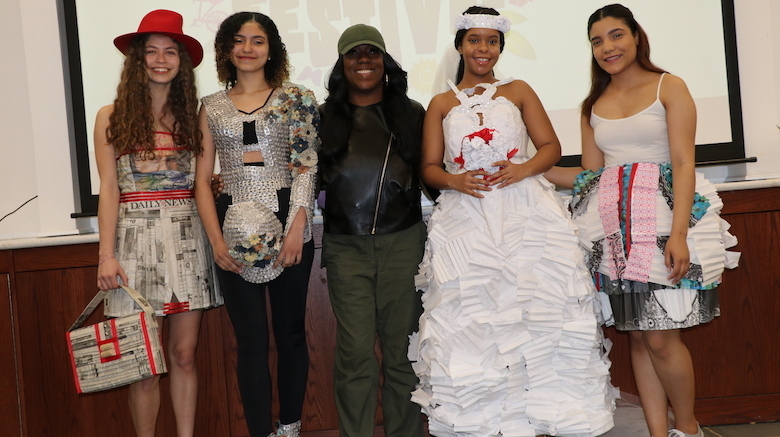 Alumna Bridget Ward, a speech pathology major-turned fashion designer, created the unique Daily News dress. 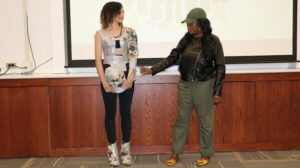 She returned to her alma mater April 9 to show off her sustainable fashion line during the festival, hosted by the campus’ Go Green Gen Up and Science clubs. 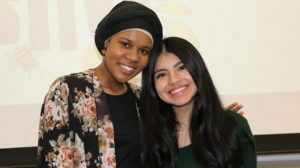 SJC Brooklyn students Sally Idris, left, and Maria Guanga. 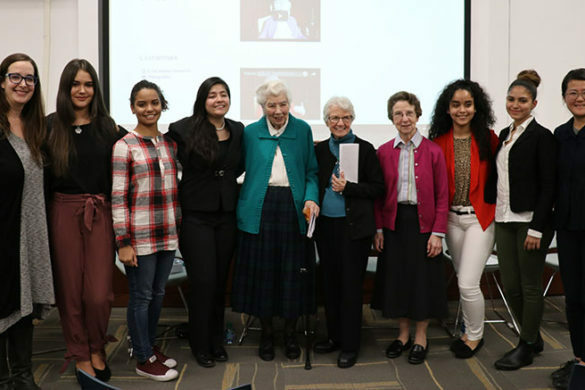 Sally Idris, president of Go Green Gen Up, and Maria Guanga, vice president of Go Green Gen Up and president of the Science Club, were excited about the event’s turnout. The two seniors — both majoring in biology and minoring in chemistry — said they often see people on campus putting the wrong items in recycling bins. Events like the Go Green Festival can help teach the public how to recycle, they said. In addition to Ward’s fashion show, the Go Green Festival featured a recycling game, where players were timed for one minute as they were challenged to separate garbage, paper and plastics. The festival also featured work stations where students painted recyclables and used their imaginations to assemble useful creations out of old materials. The afternoon’s best recyclable — so said judges Joseph Wilson, associate director of operations; Erica David, assistant director of the ACES program; and Kris Percival, adviser of the Go Green club — was a pair of fish made of plastic. 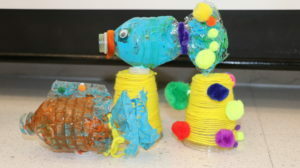 Students developed the idea to symbolize plastic harming the oceans. 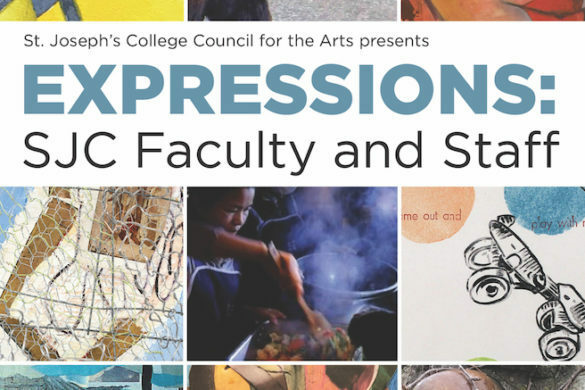 Ward, a 2018 SJC Brooklyn graduate, ultimately found her true passion for fashion design during her last semester at the College. Ward entered a fashion contest after graduation and decided to use an unconventional material: paper. The outfits in the wardrobe she entered were created by gluing together sustainable materials, such as printing paper, coffee filters and scrapbook paper. 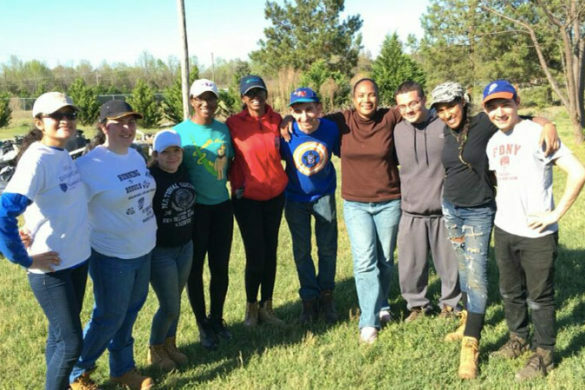 Student Amalfi Collado, left, and SJC Brooklyn 2018 graduate Brittany Ward. Her innovative designs led to a first-place prize — and the week in Paris that came with winning. She took the trip in December. 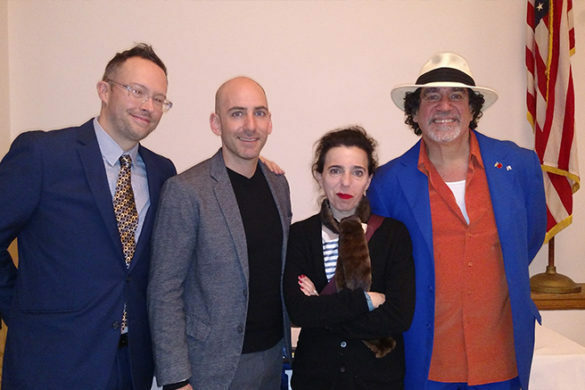 With a fashion design contest win under her belt, Ward is working on opening an online boutique featuring ready-to-wear women’s clothing. 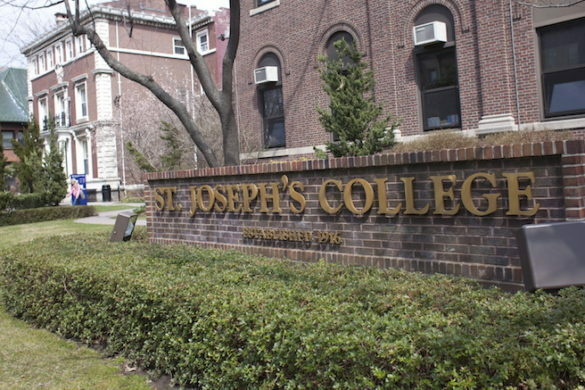 While the clothes in her boutique will be made of traditional fabrics, Ward said she was thrilled to be invited back to St. Joseph’s to showcase her sustainable dresses for the festival. “I’m just happy to come back here and show everyone what I’ve been doing,” Ward said.